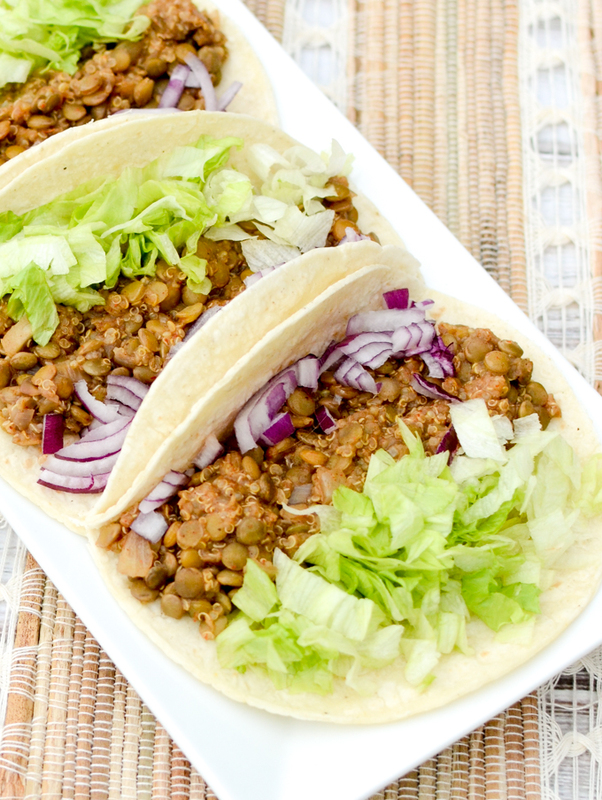 My recipe for Easy Vegan Lentil Tacos was almost named “Hybrid Gringo-Mexican Vegan Tacos” instead. Why, you ask? Yes, you are correct. I have a taco story I’d like to tell you. Actually, less a story and more a lesson. The boy and I ventured down to Maxwell Street Market a few weekends ago for breakfast tacos. No, these were not egg and cheese and sausage filled. It was indeed about 10 a.m., but I ate lingua (beef tongue) and nopales (cactus) tacs. I ordered in español (brushes shoulder off) and then el vendedor asked, Quieres gringo o mexicano? … Um, hi, what? Nope. 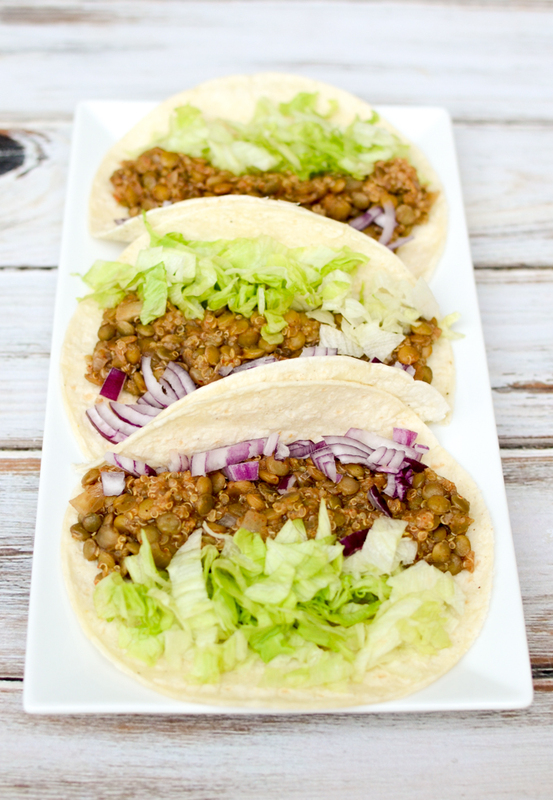 These tacs – Easy Vegan Lentil Tacos – are hybrids. Missing tomato and cheese to call them American. Missing cilantro and lime to call them Mexican. If I’m honest – and I’ll let you in on a little secret here – I’m fairly sure I chose these toppings not because they were somehow more authentic, but because I thought the color would look pretty in pictures. And I was right about that. Break out your slow cooker folks. 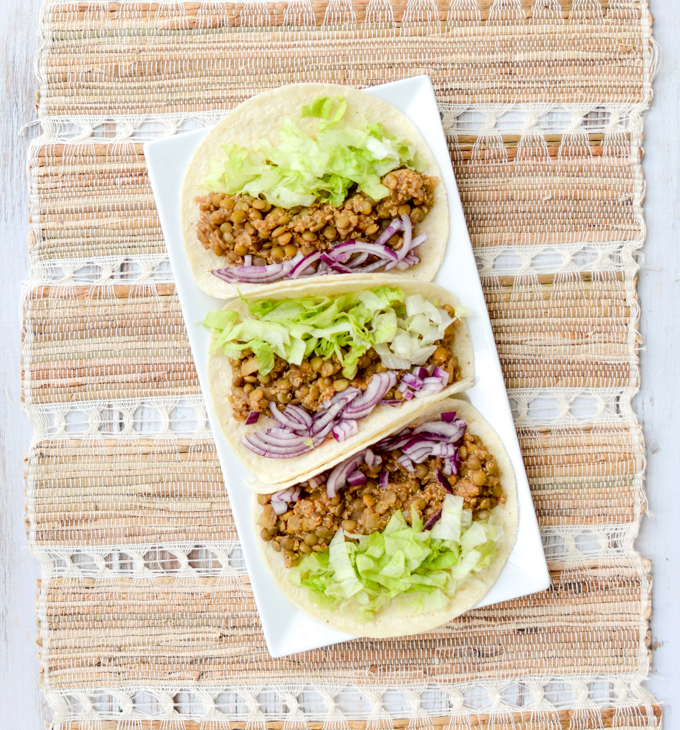 That’s how easy I’m making this recipe for Easy Vegan Lentil Tacos. Throw all your ingredients in and, voila! 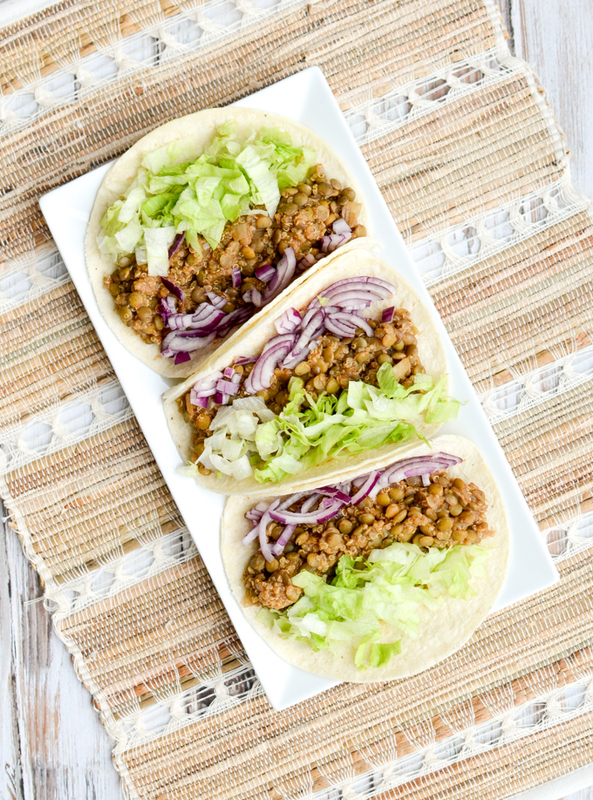 Add all taco filling ingredients to your slow cooker except for salt and pepper. Cook on high about 2 hours or until lentils and quinoa are tender. Add salt and pepper to taste. Assemble tacos. I’ve used shredded lettuce and diced red onion to add color and crunch, but use any toppings you’d like. For “American style” tacos, add lettuce, tomato, and cheese. For “Mexican style” add diced onion, cilantro, and lime.